Home » Articles » News: Digital contract options. Is IQ Option at the top now? Some time has passed by since this innovation was officially announced. It was mentioned in both the official SpotOption bulletin and on some binary trading magazines, such as Finance Magnates. Nevertheless, until now we haven’t seen anything implemented yet. Well, let’s take a look at what’s going on in this area. SpotOption is perhaps the best-known provider of platforms for binary options trading. SpotOption is used, among others, by or BDSwiss (in the past also by Banc de Binary). Having your company and bank accounts already in place, if you want to have your own broker, the only thing you need is a website to enable your clients to trade. There are several ways how to setup the website (trading platform). In-house solution: The first option is to hire a firm to program your website, database and trading platform. If I were in your shoes I wouldn’t do it because this is a rather complex exercise, very time-consuming, costly and legislatively complicated. Given the current practices of CySEC (main regulatory authority) it’s close to impossible to invent a platform on your own. Companies such as IQ Option, or the infamous Binatex took this way. SpotOption platform: Plenty of brokers are using ready-made platforms. SpotOption, for example, uses generic templates that are customised individually for each broker so that he or she can use them instantly. Seeing SpotOptions templates with almost every broker, this seems to be the easiest way. Let me mention a few other brokers using the SpotOption platform: bullbinary, BDSwiss. Other providers: Naturally, SpotOption is not the only provider of ready-made platforms. For instance, TechFinancials’ platform had until recently been offered by 24Option and OptionsXO. Honestly, I am not that much impressed by the platform, but it is a matter of personal liking which one you choose. Now you know who and what SpotOption is. And it is SpotOption to have launched this innovation. 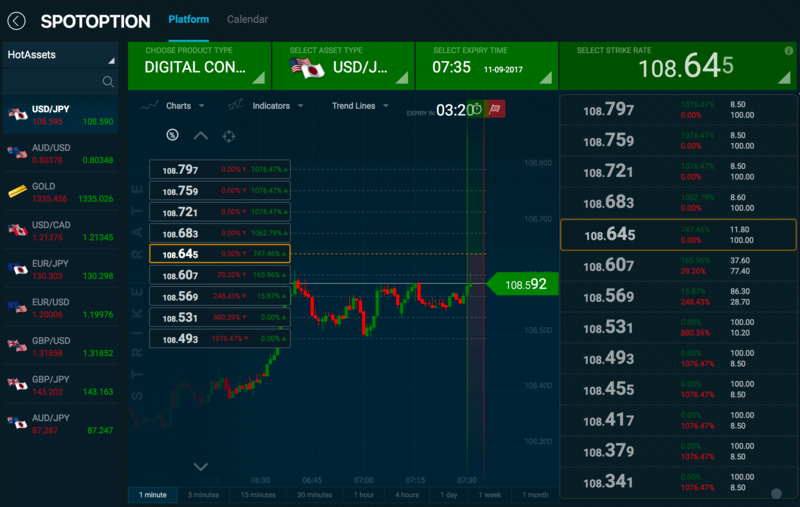 Following the introduction of digital options trading by IQ Option, SpotOption didn’t hesitate to create a concept of digital contracts. Digital options are something between Forex (CFD trading) and binary ladder options. You simply choose a strike price, expiration time and number of contracts to open and… go! If you want to see what this means in practice you can test with the official testing platform: try out digital contracts. I am curious when and if ever will we see this trading option be offered by the brokers. This is how trading digital contract with SpotOption works. Try it out: here. We all know how much popular the broker IQ Option is. This popularity was clearly demonstrated in our survey. The fact that IQ Option is one of the biggest brokers is no secret. It’s not long ago that the number of accounts with this broker was 16 million. Since the introduction of CFD and crypto (bitcoin) trading, the number of visitors has quintupled. This looks like a smart marketing and business move. I’m curious what comes next. And what about you? Not yet trading with IQ Option? Open a free account with IQ Option!